by Chris Woodford. Last updated: January 28, 2019. When you wake up in the middle of the night, not sure where you are, there's nothing more reassuring than the luminous dial of a watch. You don't need to find a light: just glance at your wrist and you know exactly what time it is. Watches like this glow all day long—we just don't notice their ghostly shine in the daytime. What makes them glow at night, long after all the other sources of light are dim? 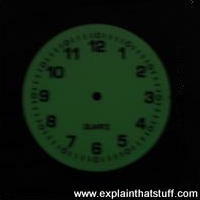 Photo: This "luminous" watch dial is coated with phosphorescent paint so it glows in the dark. It's surprisingly hard to photograph (without cheating!) because it gives off very little light. Luminous simply means giving off light; most things in our world produce light because they have energy that originally came from the Sun, which is the biggest, most luminous thing we can see. 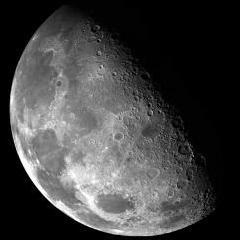 Strictly speaking, although the Moon appears to give off light, it's not actually luminous because it's simply reflecting light from the Sun like a giant mirror made of rock. Luminous is quite a vague word really. Arguably, even a flashlight bulb is luminous, because it turns electricity (electrical energy) into light and shines it toward us. But bulbs like this are incandescent and make light by making heat. Luminescent things, by contrast, make light when their atoms become excited in a process that needs little or no heat to make it happen. Photo: Luminous doesn't mean "glows in the dark": it means an object is giving off light it produces itself. Strictly speaking, that means the Sun (1) is luminous but the Moon (2) is not. Pictures courtesy of NASA Goddard Space Flight Center (left) and NASA Jet Propulsion Laboratory (right), via NASA on the Commons. What's the difference between luminescence, fluorescence, and phosphorescence? When we talk about "luminous" watches and paint, what we really mean is phosphorescence, which is very similar to fluorescence: the process by which energy-saving lamps make light. Fluorescent materials produce light instantly, when the atoms inside them absorb energy and become "excited." When the atoms return to normal, in as little as a hundred thousandth of a second, they give out the energy that excited them as tiny particles of light called photons. Shine ultraviolet (UV) light light on a stolen TV or camera and you might find someone's address shining back at you, written in invisible ink. The ink is made of fluorescent chemicals that absorb energy from the UV light, become excited, and then give out the energy as photons of visible light. Switch off the UV light and the ink disappears again. You can read more about how atoms make light in the feature box in our article on light. 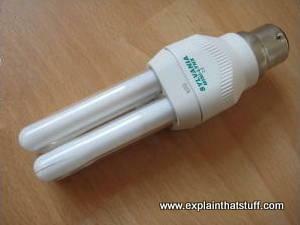 Photo: An energy-saving compact fluorescent lamp (CFL). 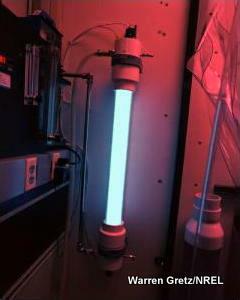 The fluorescent chemical is a kind of chalky white coating on the inside of the thin glass tubes. You might have noticed that lamps like this continue glowing a little bit even after you switch them off? Like luminous watches, the phosphor chemicals are still excited enough to give off light for some time after they've been stimulated. Phosphorescent materials work in much the same way as fluorescent ones, except that there's a delay between them absorbing energy and giving out light. Sometimes phosphorescence lasts for a few seconds after the stimulating energy has been removed; sometimes—as in luminous watches—it lasts for hours. You've probably noticed that it takes a bit of time to "charge up" a luminous watch with energy before it will glow in the dark. You might have also noticed that a luminous watch shines most in the early part of the night. By the time dawn breaks, it's typically run out of energy and stopped glowing. That should come as no real surprise. A watch can't make light out of nothing at all without violating one of the most basic laws of physics—the conservation of energy. 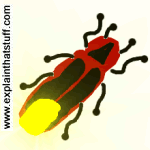 Fireflies and glow-worms (their larvae) are the best-known examples of bioluminescent creatures. They use a complex reaction to make light from a pair of chemicals called luciferin and luciferase stored in their tails. Bioluminescence is a special kind of chemoluminescence that happens inside living things. Squid, shrimp, sardines, plankton, starfish, and all kinds of other marine creatures use bioluminescence for communication, camouflage, or defense—flashing to attract mates or warn off predators. Photo: Bioluminescence in action. 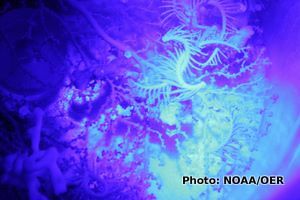 Left: Corals and crinoids bioluminescing in the North Atlantic. Photo courtesy of Bioluminescence 2009 Expedition, NOAA/OER, published on Flickr under a Creative Commons Licence. 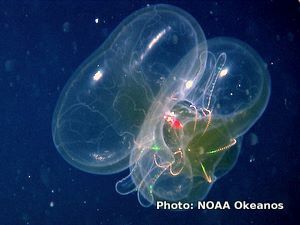 Right: A bioluminescent ctenophore. Photo courtesy of NOAA Okeanos Explorer Program, Gulf of Mexico 2012 Expedition, published on Flickr under a Creative Commons Licence. What can we use luminescence for? 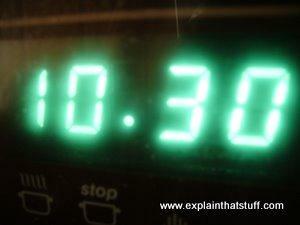 Photo: The ghostly glow of this oven timer is caused by phosphors that make green light when electrons strike them, briefly "charging" them with energy. It's an example of what's called a vacuum fluorescent display. "Luminous" (phosphorescent) paints, energy-saving fluorescent lamps, and fluorescent (high-visibility) jackets are obvious examples. But there are many other ways we use luminescence too. Old-style, cathode-ray television sets (and oscilloscopes) make pictures by firing electron guns at a screen coated with phosphors (phosphorescent chemicals). Lasers make their powerful beams by a process called stimulated emission, which happens when atoms are forced to give off photons over and over again. UV lights are used to produce phosphorescence in a variety of medical tests, in archaeological research, and in forensic science to aid the detection of crime. 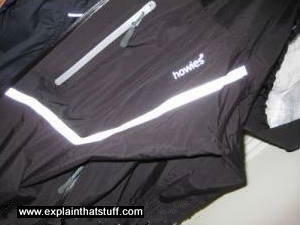 Photo: Safety stripe: old-style, fluorescent silver paint makes this black jacket show up at night in car headlights or, in this case, in the flash of my camera. This is the sort of low-tech, high-visibility that has been around for decades and its big drawback is that it quickly dulls and loses its reflectiveness. Newer high-visibility jackets and vests have retroflective fabric sewn directly into them. It's made from materials such as 3M™ Scotchlite™, which uses tiny reflective beads to throw back more light. It's far brighter than old-style paint and lasts much longer. Some uses of luminescence are even more surprising. Many washing detergents contain ingredients known as optical brighteners, which are actually phosphorescent chemicals. 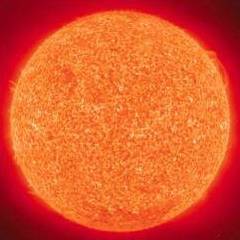 Sunlight contains a mixture of ordinary, visible light (which our eyes can see) and ultraviolet light (which we can't see). When sunlight falls on recently washed clothes, atoms of the optical-brightener chemicals, left behind by the detergents, become excited and convert the sun's ultraviolet light into ordinary light. As a result, when you look at freshly washed white clothes, you're supposed to see brighter, slightly bluer reflected light produced by the optical brighteners. The idea is that your clothes look cleaner and brighter, which is why TV commercials used to talk about "bluey whiteness" and featured smiling people holding their clothes up to a window (where there's more UV-rich sunlight) to see it. It's amazing some of the places where you find science—even lurking in your laundry! How fluorescent light beats burglars! Photo: Ultraviolet lamps like this can be used to show up the "invisible" security inks that deter thieves. Photo by Warren Gretz courtesy of US Department of Energy/National Renewable Energy Laboratory (DOE/NREL). The best intruder alarm in the world can't always keep thieves out of your home and if your valuables get stolen they're often gone for good. Even if the police catch the crooks and recover some of their loot, how can they ever return it to its rightful owners? Who knows which camera or TV belongs to which person? Science offers a really easy solution! All you have to do is mark your property with an invisible, fluorescent ink that shows up only in ultraviolet light. When the police recover stolen property, they wave an ultraviolet lamp over it, the markings (maybe your name or zip code) show up, and they instantly find out to whom it belongs. Photo: How invisible security inks and paints work, compared to normal inks and paints. 1) In ordinary white light (colored yellow here so it shows up), normal inks show up because they absorb all light rays except those of their own color, which they reflect. So red ink looks red in white light. 2) In UV light, ordinary inks tend to turn black. 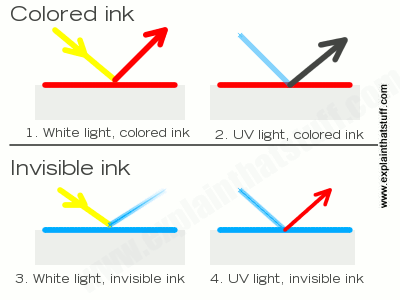 3) When white light (again colored yellow in this diagram) shines on invisible UV ink, the ink reflects the light as light our eyes can't see—so it remains invisible. 4) In UV light, the invisible ink reflects visible light—so it shows up red or another color. Introduction to Fluorescence by David M. Jameson. Taylor & Francis, 2014. An accessible but comprehensive introduction to the science and uses of fluorescence. Luminescent Materials and Applications by Adrian Kitai. John Wiley & Sons, 2008. A great guide to cutting-edge applications such as quantum dots and OLEDs. Luminescence: From Theory to Applications by C. R. Ronda (ed). Wiley-VCH, 2008. A collection of papers that begin with the light emission processes, before covering phosphors and their applications. Phosphor Handbook by Phosphor Research Society. CRC Press, 2007. A comprehensive reference covering all aspects of phosphors and their uses. The Day-Glo Brothers: The True Story of Bob and Joe Switzer's Bright Ideas and Brand-New Colors by Chris Barton. Charlesbridge, 2009. How experiments with UV light and fluorescent paints led to the development of day-glo colors. Fluorescence Reveals the Incredible Productivity of America's Corn Belt by Betsy Mason. Wired, April 3, 2014. NASA satellites are using fluorescence to map photosynthesis from space. Photoluminescent Nanoparticles Kill Cancer by Dexter Johnson. IEEE Spectrum, April 17, 2014. Researchers discover how tiny particles of copper-cysteamine (Cu-Cy) can be stimulated with X rays to produce luminescence that will fight cancer cells. Fluorescence Is Widespread in Fish, Study Finds by James Gorman. The New York Times. January 8, 2014. There are 180 species of fluorescent fish, according to scientists from the American Museum of Natural History. The light fantastic: Harnessing Nature's glow by Paul Rincorn. BBC News, 24 January 2013. Describes some of the practical applications of bioluminescence, particularly in medicine. 3M and Scotchlite are trademarks or registered trademarks of 3M.